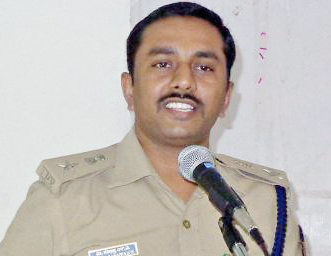 Mangaluru, Dec 3, 2015 : The State government has relaxed the rules regarding physical fitness standard - for tribals residing in the periphery of forest - while recruiting to police department, said DK Superintendent of Police Dr S D Sharanappa. Speaking at the monthly SC/ST grievances meeting Dec 1, he said that as per the new direction, the minimum height has been relaxed from 168 cm to 155 cm and chest from 86 cm to 75 cm for male candidates. For female candidates, the height has been relaxed to 150 cm from 157 cm and weight to 45 kg from 50kg. The SP called upon the members of the community to create awareness among the tribals on relaxation in the rules for the benefit of the tribes. Further, Social Welfare Department has claimed that it now strictly prevents overstay and frequent visits of students who have passed out, at hostels run for the weaker sections of society. Dakshina Kannada district social welfare officer G. Santosh Kumar said this at a monthly meeting called by the Superintendent of Police to hear and redress grievances of people belonging to the Scheduled Castes and Scheduled Tribes, here on December 1, welfare officer Kumar said he learnt about the issue during one of his visits to these hostels. He said he took the help of the police to prevent this. Whenever such complaints were noticed, the police would detain those students and let them off after getting a written statement that they would not repeat the mistake. This has dissuaded many students. The participants alleged that funds meant for the welfare of SCs and STs were being misused by local bodies. They would improve roads or provide street lights to an area citing that a few people belonging to SCs,STs were staying there. To this, Kumar said he was keeping a system in place to check it. Regarding payment of compensation to victims of atrocities, the officer said 25 per cent of it was paid immediately after a case of atrocity was registered by the police and the balance was paid within 48 hours of the court direction. Meanwhile, DK SP S.D. Sharanappa, told the meeting that the government recently relaxed the physical fitness standards for tribal people residing in forest areas for recruitment to police forces. The minimum height had been reduced from 168 cm to 155 cm and the measurement of chest from 86 cm to 75 cm for male candidates while for females, the height had been reduced from 157 cm to 150 cm and weight from 50 kg to 45 kg. Recruitment for police constables and sub-inspectors was going on and soon process for recruiting another 700 sub-inspectors would start. Responding to another suggestion, SP Sharanappa said the police were examining a proposal to set up a traffic police station at Belthangady.